For stand-alone use the MADIface USB can be powered by any USB power wall wart or USB battery. Without a host computer the device enters a pre-configured mode. Using one input the MADIface USB is clock slave, utilising the sample rate found at the input. Active AutoSelect means either input can be used. The output format also adheres to the input format (56/64 channel mode, 48k/96k Frame). Using two inputs Double Processing Mode is activated, for two independent paths, including two SteadyClocks. The internal routing also shifts from parallel output to cross-coupled. Therefore in stand-alone mode the unit instinctively operates as an active repeater, in effect this doubles the maximum cable length of 100 m coaxial and 2,000 m optical. 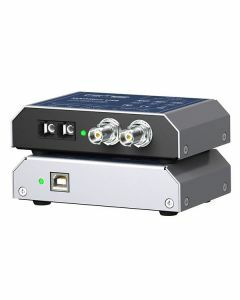 With two inputs connected the unit operates as bi-directional format converter, converting coaxial to optical and vice versa instantaneously. Thanks to a completely newly generated signal, jitter suppression by SteadyClock, and reclocking of the MADI output, the MADIface USB delivers refined, not basic, format conversion.